Established in 1884 in London, the YMCA is a worldwide organization dedicated to empowering young people through Christian principles with 58 million members across 119 countries — each national association working independently. 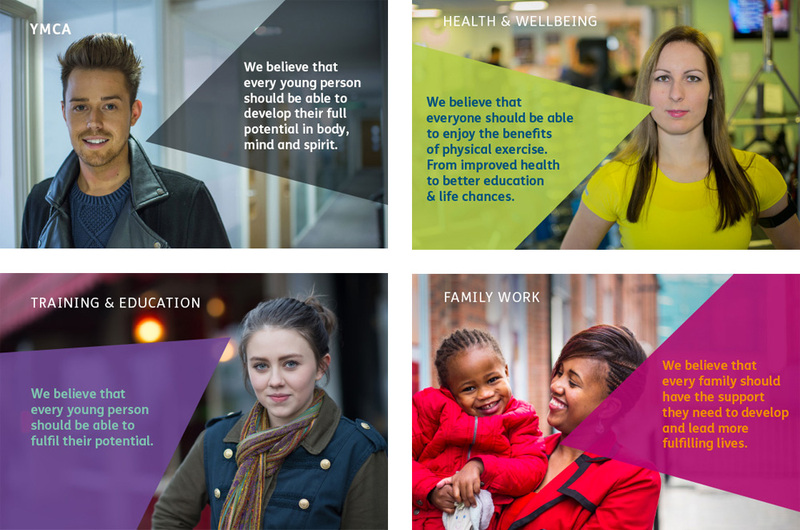 The YMCA of England is made up of 121 member YMCAs in over 530 different communities and its focus, in contrast to the gym-like approach of the U.S. YMCA, is more of a charity and community service. They provide “safe, supported accommodation for young people in England” with more than 10,000 beds and also offers a range of education, skills-based training, placement and apprenticeship schemes. With an increasingly competitive charity landscape in the UK, the YMCA of England introduced a new identity designed by Cheltenham-based ArthurSteenHorneAdamson. The YMCA brand mark has been constructed using a triangular grid. Originally established over 130 years ago and symbolising the values of BODY, MIND and SPIRIT the use of the triangle gives the brand mark a visual link back to the founding principles of YMCA. In use in England since 1967 the previous logo was horrible. Really, just horrible. The stretched typography had nothing to do with the “normal” “Y” — normal in quotes because that “Y” was whack on its own. At least the red triangle, that has appeared in all YMCA logos and represents body, mind, and spirit, was present. The new logo doubles down on the triangle aspect of the YMCA and presents a wordmark based on a triangular grid. The result is, other than very triangle-y… not very pleasant. The letterforms appear uncomfortable and heavy and almost as if they weren’t fully resolved. The triangle in the “A” draws too much attention and in its effort to be asymmetrical comes across as a play button. (Also, don’t tell anyone but the triangle is off the grid). 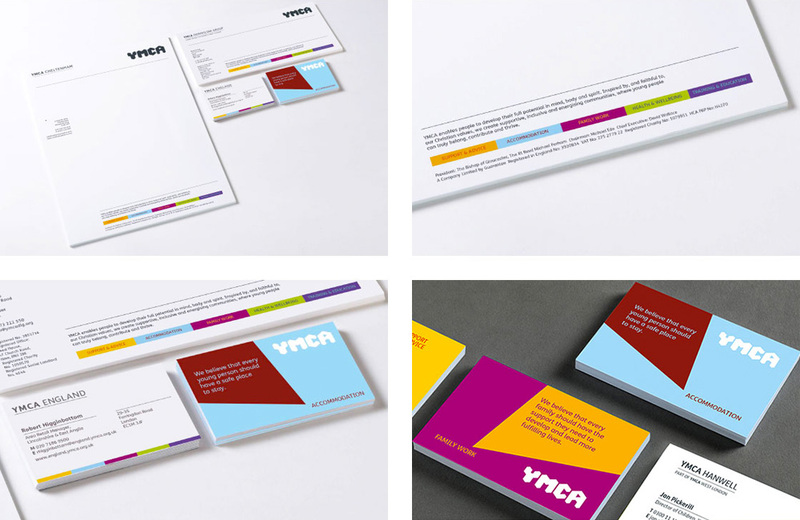 By using ‘the point’ of its triangle as a dynamic graphic element, YMCA is able to deliver sharp focus to its communications and establish a distinctive visual language. In application, the identity gets a little better. Not much. The brochure looks interesting with the “point” application and the non-monochromatic pattern but everything else lacks some sophistication and innovation. I feel a little bad being negative in this review because clearly this was a big deal for the YMCA — their first big change since the 1960s — and while it’s an improvement over the old and it does skew more youthful this feels like a missed opportunity to create a standout identity for one of the most recognized non-consumer brands but, hey, at least it doesn’t use Circular. Thanks to Matt McRae for the tip. Established in 1884 in London, the YMCA is a worldwide organization dedicated to empowering young people through Christian principles with 58 million members across 119 countries — each national association working independently. The YMCA of England is made up of 121 member YMCAs in over 530 different communities and its focus, in contrast to the gym-like approach of the U.S. YMCA, is more of a charity and community service. They provide \"safe, supported accommodation for young people in England\" with more than 10,000 beds and also offers a range of education, skills-based training, placement and apprenticeship schemes. With an increasingly competitive charity landscape in the UK, the YMCA of England introduced a new identity designed by Cheltenham-based ArthurSteenHorneAdamson.